Shakti – New technology for spiritual process. Behavioral neurosciences program Associate researcher. On the other hand, things get a bit more interesting when we look at Shakti’s positive effects. First of all, there are two primary ways to use Shakti. In one, the person is looking for lasting after-effects. In the other, the person is looking for more dramatic experiences. Like what they may have seen in documentaries featuring Persinger’s work. There’s a safety precaution, though. These sessions should last an hour, and should be done more than once in three weeks, following a successful session. In looking for lasting positive effects, the person needs to repeat the sessions once a week, in normal states of consciousness. These sessions last 30 minutes. Even though most people became interested in this technology because of the more dramatic things possible with longer sessions, most Shakti users are opting for the shorter session, done more often. Enough suspense. Here’s some of the effects produced during or after repeated sessions. – calm – a reduction of depression – enhanced introspective skills – lucid dreaming – out-of-body experiences – a greater sense of self – a sharp reduction in anger – enhanced visual acuity – pleasant detachment – floating sensations – “a sense good spiritual balance and general sense of being centered and optimistic” – “During my session it was as if I were seeing through the mask” – “wonderful vivid dreams” – “I had the strong feeling of sitting just reversed in my room and facing the opposite wall (eyes closed). This was a strong visual impression. – “I saw a black board with several words written on it. It seemed like I understood these words but when tried to look closer I noticed that they were written in a language unknown to me” – “relief from something that always seems to be there. ” These vary from one person to the next. Each brain is different. Some fight back, trying to reestablish the old neural settings in a process called metabolic snapback. Visit the website for more information. www.spiritualbrain.com Longer sessions have produced visions of many kinds, mostly brief, and only a couple of people had truly episodic visions. I mean the kind that happen in NDEs or the native American vision quest. So far, it seems that being totally relaxed, still, and in a silent place help a great deal, and not everyone is able to manage the complete silence. One user tried white noise as a background, but that only interferes. A lot of the temporal lobes are involved in monitoring ambient noise, and white noise only adds to this activity, which must be quieted to allow Shakti to recruit the same area fully. Most people who are interested in this technology will prefer to read the testimonials taken from reports by participants. Now that Shakti is past the safety phase, the next goal emerges. Shakti still isn’t covered by any insurance, so the same disclaimers, etc. are still in place. Read them. But the goal is now to find whatever procedures are necessary to guarantee each person a spiritual process, even dramatic visions. So far, most Shakti users (over 90 %) have had something to report, and the remaining few are working through a variety of procedures and new wave forms. One of them, “Shakti 5” is available to all participants on request, and it has elicited experiences when the standard one didn’t. I feel sure Shakti is on the right track. One day, we may find, partly thanks to the present Shakti participants, that the spiritual process, different for each person, can be engaged with a helmet and a few CDs. The spiritual process, as it’s understood traditionally, has a lot in common with Shakti. Both take time. Both can involve a ‘dark night of the soul’ both are different for each person. Both offer no promises to any one individual. But I can and do make one promise. That I will go on working out procedures for each person, until a session design appears for that person that works. And so on. Until each person has the same chance at spiritual transformation, no matter what their history or background. Copyright: Todd Murphy, Author and AVS Journal, Michael Landgraf, Publisher (2006) Granada Hills, CA. All rights reserved. What the hypothesis says is that when activity in a given brain part on one side of the brain (or an entire hemisphere more generally) becomes active enough, crossing a threshold, the activity can spill over into the same structure on the opposite side of the brain. Given that most brain parts have symmetrically opposite functions (‘functional homologues on the two sides of the brain, the phenomena that accompanies this is a dramatic shift in the person’s experience. My fear and anxiety didn’t just stop. It turned into the opposite. Bliss. Joy. So wonderful to be alive. Just to see the sky is ecstasy. Each person is beautiful. My right amygdala had been active. Now it was quiet, after applying the amygdala’s signal only over the left side. I had been in anxiety and pessimism, living in a storm of awful thoughts for a few days. Now, I was in bliss. Other things had happened. My week with an active right amygdala seems to have recruited my right hippocampus, too. And many of it’s associated phenomena only emerged when my right amygdala was told to shut up. I could heal by laying on hands. I tested it many times. That’s tapered off a bit in four years since all this happened, but not without many ups and downs as my own Shakti session designs change. I could also do remote viewing, but like many who’ve had the experience, I chose not to practice it, because I found myself uncomfortable at some of the things I saw. I did confirm some of these perceptions, though. I saw auras, too, but not in the brilliant colors some psychics describe. Just faint glows around people when I looked for them. I experienced quite a lot of hypnogogic phenomena, too. Brief perceptions, clearly from within, that happened while I was falling asleep. I continued doing sessions, but I didn’t really experience anything new using the DAC, with it’s single signal, until I got a new wave form from Dr. Persinger. It belonged to the hippocampus, a cognitive structure. One that deals in words on the left and in non-verbal cognition on the right. Soon, I knew what it would do on both sides of the brain. On the right, it quieted mental chatter and enhanced visualization skills. It also enhances what’s called ‘positive thinking’; the expectation of positive outcomes for ongoing events. On the left, it encouraged mental chatter, and negative expectations for the outcomes of ongoing events. Over both sides, it reduced the intensity of emotions overall. Shakti results continue to support these generalizations, although they have yet to be published. So, now I could apply the amygdaloid signal over the left – OR – the hippocampal signal over the right. The trouble was that left amygdaloid activation tended to spill over to the right amygdala (via the anterior commisure), and right hippocampal activation tended to spill into the right amygdala, too (via their extensive connections). I wanted to do both at once. And for that I need two signals at once. I wanted a stereo DAC. But none existed. I’d have to go without it or invent it myself. So that’s what I did. The only audio equipment I had to work with was a computer sound card, so that’s what I worked with. I recorded the sounds the DAC made, as though the signals were common sounds. I saw instantly that it wasn’t the same. Not even close. I set out to find a software that would let me create sound files for a PC, using the wave forms provided by Dr. Persinger as templates. Seven drafts, and scores of audio softwares later, I had files that worked. A bit further along, I had a CD that played the sound files. Designing the Shakti helmet was another matter. Unlike the Koren helmet, it had to have safety as it first concern. That meant, of course, that it had to have separate output to the two sides of the brain. It also had to omit all signals not specifically derived from neural brain structures. Knowing that a given effect emerges from a structure on one side allows one to stop the effect by applying the same signal to the other side. Anything Shakti can do, it can undo, if the person uses their tech support and follows the procedures. Also, the helmet had to have coils outside the temporal lobes, so that repeated use would not quieten the parietal and especially the frontal lobes. Further, the rotating coils used in some Koren helmets needed to be omitted. They recruit larger areas of the brain, more than what is needed to elicit experiences. It’s also less well-tested in Persinger’s labs for repeated use. Once I had the invention, it needed to be tested on more people than just myself if it was ever going to be more than only my own plaything. And, in spite of the many studies done at Laurentian University, it could be argued that the safety of the sessions found there did not apply to self-administration of two signals at once. When I ran the first successful Shakti session, using a sound card and an impromptu headset improvised from two sets of DAC coils, I was satisfied. I won’t go into the details, because, as It’s inventor I have a stake in what’s said about it. Once others began using it, those with more dispassion than I, began to speak. They also have more typical brains than I have. Mine has TLE in it’s past. Others don’t. I offered prototypes of Shakti from my website at www.spiritualbrain.com and right away I began to get applications to participate in a safety study. I had to start with a safety study, of course. I had to begin saying that we didn’t know how safe it was for individuals to use it themselves. But that didn’t stop a lot of people, mostly men, from applying to participate. After about a year, it became apparent that Shakti was safe. There were a couple of incidents. One man, using the standard helmet and CD, found himself having too many moments when he had a word on the tip of his tongue that he couldn’t get out, and a growing sense of detachment that interfered with his work in sales. I knew that these were moments when the right hippocampus was more active than the left. He had been using Shakti for weeks, experiencing this, but not availing himself of tech support. In the end, he corrected things using the left side signal only, applied over the left side. In spite of his experience, he later wrote that he’d give up his Shakti when it was pried from his “cold, dead fingers.” A few people have had passing headaches. These are also associated with the hippocampal signal, and they seem to stop using the left channel alone, or using common headache pills. They really aren’t headaches, actually. They’re better described as feelings of pressure. They tend to happen for a few sessions (when they happen at all), and then to stop. Less than 15% of Shakti users get them at all. Those are the two most unpleasant and common side effects of Shakti, now with over a hundred users. Some years later, while reading about near-death experiences (NDEs), I read an account of an NDE that included a story of being in an infinite, black the void with a tiny, brilliant point of light in the center. At last, I had some point of reference for the experience that had so shattered me as a child. Whatever it was, it could appear during the human death process. I was very excited, and of course I wanted to know more. I found a couple of fragmentary reports that were similar in the works of Wilder Penfield, the Canadian neurosurgeon who first mapped the brain’s surface by stimulating it with an electrode, and then observing the patient’s response. I wasn’t really looking to understand my own experiences so much as to understand what science had to say about death and dying in the human species. NDEs seemed to offer the best evidence about that. And so it seemed a simple enough thing to do to watch television documentaries on the subject. One of them was to completely change my life. I was staying at a friend’s house for the week end, watching a program that featured near-death experiencers telling their stories. It featured a segment filmed in a Canadian Neuroscience Laboratory. A man was shown wearing a motorcycle helmet and a blindfold. to describe experienced by saying that he felt himself to be in infinite black space with a tiny point of light, very very bright, at the center. Now, I was really excited. I knew that I was being shown an experiment, and that all experiments are guided by theories. Beside myself with excitement, I stood up and kept watching the documentary. A couple of months later, I read a book that mentioned this line of research, and gave me the name of the Researcher. Dr. Michael A. Persinger. Some of these concepts are totally valid, but they’re still controversial. Ordinarily, that can be a good thing. But nothing seems to inspire scepticism and ridicule from scientists like efforts towards the integration of science with spirituality. But Persinger had found a way out. He published quite a lot of papers correlating religious and mystic experiences with patterns of neural activity. Now, by itself, this might have created a certain amount of hostile criticism. Except for one thing. He didn’t study religious and psychic experiences. He studied the “propensity to report” them. And that’s sound methodology. Talking about religious and spiritual experiences is one of the most common human behaviors known. Everybody does it at some point in their lives, if only to express disbelief, and all human cultures (excepting a few communist regimes) support it. A statistical study of the people who make such reports is totally sound science. On reflection, it seems strange that nobody thought of it before. What he concluded was that religious experiences were more likely to happen for people whose brains put them on the high end of a spectrum; one that includes TLE at one of it’s extreme ends. Now, it was beginning to make sense. Mystic experiences share a lot in common with seizures and NDEs because the human death process requires the human brain to be pre-wired for certain experiences. When a seizure recruits one of these areas, it includes whatever phenomena that area supports. In one place, it might be an OBE. In another, it might be a being made of light. This explains why only some TLE seizures elicit mystic and religious experiences. When I was a child, I had temporal lobe epilepsy (TLE). TLE is a form of epilepsy that does not cause convulsions. What it does cause is altered states of consciousness. In most cases, TLE causes events that we’re really not very interested in here. It’s symptomology is dominated by things like lip-smacking, staring off into space, repeated movements, and repeated recurring memories. In some cases, TLE can cause distinctly Spiritual Experiences, and this is what it did in my case. I had strange sensations in my body, incredibly intense moments of fear, and a very, very compelling visual experience. It had two Manifestations. One of them was when my eyes were open. Then, I would see things as though they were larger than they actually were, and farther away. An object that was 1 foot from me, and 1 foot tall would seem as if it were 10 feet away and 10 feet tall. The room I was in seemed huge. This illusion is called macropsia. Lewis Carroll, author of ” Alice in Wonderland ” may have experienced something similar. The magic mushroom of his story made Alice grow larger and smaller, and that’s almost the same as feeling the world grow smaller and larger. When I closed my eyes during this experience, my sense of the room being larger expanded so that what I saw behind my eyelids was infinite space, broken only by a single point of light. It seemed to be both infinitely bright and infinitely far away. Like most childhood TLE, mine ended as puberty began. I stopped being concerned with experiences in consciousness, and became very interested in women. For years, I gave no thought to these experiences at all. Later, I became interested in spirituality, like most people who have childhood altered state experiences. I did meditation, some Yoga practices, and began reading spiritual teachings, mostly Eastern philosophy and a little bit of Western mysticism. I also started remembering my childhood night time TLE Seizures (also called Complex partial seizures). it was obvious to me that although the spiritual path was very pleasant, at least usually, and my seizures were unpleasant, even terrifying, they were far more powerful events than anything I was getting through spiritual practice. As a child, I thought that I was the only one having these experiences, should and I had a feeling that something terrible would happen if I ever told the adults, so I didn’t. As an adult, I was pretty sure that I was not the only one, but as I kept reading spiritual books and scriptures, I felt sure that I had seen things that were quite beyond any guru or mystic tradition. Now let me backtrack a bit. Earlier, I’d spend some time doing more disciplined studies in a completely different area. The history of science. I was deeply influenced by T. S. Kuhn, author of ” The Structure of Scientific Revolutions ” and ” The Copernican Revolution”. One of Kuhn’s points was that scientific theories guide researchers as they choose which experiments to perform. The popular misconception is that researchers perform experiments and then build their theories out of the results. Instead, new theories come first, and the experimentalists are concerned with either validating them or falsifying them. It’s impossible to do an experiment without having a theory. Perhaps the experiment is designed to confirm the theory or perhaps to falsify it. In either case, experiment and observation, even facts, are described in the vocabulary used in a scientific theory. And so I had some experience with spirituality, TLE Seizures, and the history, methodology and philosophy of science. by T. F. Collura, Ph.D., P.E. The brain takes in experience in chunks. We call them “process bursts”. Chunks come in raw, cooked and stale. The “process burst” takes in the “experience” that feeds it, and it has a life of its own. It is initially “raw”, being only aware that something has happened. Shortly later, it “ripens”, and contains information regarding the details of the input. Still later, it relaxes, and “chews on” the data, and reaches a stable plateau of “understanding”. Still later, it introspects, ponders the information, produces intuitive and deeper interpretation. Finally, it dies away. The “process burst” is like a bubble that starts out small, grows, pauses, grows some more, and finally disappears either by bursting or by collapsing. These bursts occur in parallel. There may be thousands of them at once, in different parts of the brain, processing different types of information, different modalities, different views. They are also coordinated by cross- communication with each other, using combinations of feedback, feed-forward, and collateral connections. This provides the spatio-temporal binding that fuses thousands of responses into the cohesive experiences that we interpret as perception, conscious awareness, and the sense of identity. Chunks of reality can be homemade or can come out of a box. Amidst the cacophony of signals recorded in the EEG, we can see these bursts coming and going. The key to the brain’s function is in processing these bursts in trains, one after another. The intrinsic EEG is built of these bursts as produced by lower brain centers creating rhythms via the reticular formation, ascending brain tracts, and thalamus, as well as intracortical reverberatory activity. The EEG waves produced by light and sound stimulation are of course temporally and casually related to the incoming trains of stimulation. In fact, these bursts are in this case what we call “evoked potentials”, and that have been studied for many years, albeit with limited insight and few conceptual breakthroughs. The common ground in both is that process bursts are produced at a certain rate. When a neural sub-circuit in mid-burst is hit with another incoming stimulus, the burst that is in process is interrupted, and the sub-circuit now begins processing, using the state that was produced by the preceding burst. This is why the rate at which the bursts are produced is important. We can think of the next stimulus as “opening” or “cracking” the existing burst. It “probes” the neural sub-circuit by stimulating it when it is in the state produced by the previous burst. This state can be the state of being in a “raw” burst, a “cooked” burst, a “stale” burst or, if long enough, no burst. These bursts are the “chunks” of experience that the brain uses to create reality. By using these bursts as stepping stones on a vast pool of possible thoughts, the brain navigates its way on the sea of mind, and thus go where it will go, based on the progress from one stone to the next. You feed on the chunks of reality that you create. If bursts are produced at a certain rate, then the process of brain states will take a certain path. For example, if the bursts are processed at the “alpha” rate, 10 per second, then successive bursts are produced while the sub-circuits are in a relaxed state, hence each burst finds itself built upon a relaxed sub-circuit. The relaxed state of the brain is thus created and reinforced. This also explains why 10 Hz stimulation is relaxing. It in essence “puts” the brain from stone to stone, as though the brain were a marionette on strings, and were being walked along by guidance. Now if the bursts are produced at a very slow rate, say 5 per second, then each new burst is built upon a sub-circuit that is in a deeper, introspective state. This can lead to an intuitive state of mind, but it can also lead to a distracted, understimulated one. This is why kids with ADD typically show a lot of theta waves. Their brains are processing bursts at a slow rate, and the resulting brain state is in accordance with that. If the bursts are produced at a rapid rate, say 15 per second, each stimulus finds the neural substrate in a stimulated, alert state. It is aware of its input, but has not had a lot of time to ponder it, relax, or find the deeper meaning. Kids with Attention Deficit Disorder typically have a low level of beta, so they do not have enough of this going on. Light and Sound stimulation primes the pump, giving you a taste of another reality. What happens with photic stimulation is that you give the brain practice with creating and “opening up” the bursts at a given rate. It is like training wheels, or pushing a child along on his bicycle. The brain gets to experience it. It is spoon feeding the cortex with the experience of processing information in a certain way, without the brain having to produce the rhythms on its own. This also explains why external stimulation can produce a temporary effect, but generally little or learning. The cortex gets to experience the state produced by the burst processing, but it has not learned how to keep that state going. It has not learned to produce the rhythm on its own. Light and sound stimulation can be fun, invigorating, deepening, tiring or even agitating. What it is doing is force-feeding your cortex with bursts, and then forcing you to process the trains at a given rate. You get to practice processing information at a certain pace, but you have not learned to pace yourself using internal mechanisms. This is why auditory and visual stimulation cannot replace EEG neurofeedback. EEG neurofeedback rewards the brain for producing (or inhibiting) the driving stimulation at the desired rate. This is in addition to allowing the brain to learn the experience of processing the bursts at the given rate. Ultimately, these bursts are taken in a very long sequence. After thousands and thousands of such stepping stones, the brain learns to find its steady-state points. These points may be locations of alertness, focus, distractedness, agitation, depression, joy, whatever. The brain tends to recover and find its equilibrium, which is presumably some state of rest or relaxation. But processing information and “lifting” itself out of the equilibrium point, the brain uses energy to reach a more excited state. This is what the bursts do. They “push” the brain into a higher state. Where that state is, and what its attributes are, depend on the trajectories of the processing of each burst. It is hoped that these considerations may motivate methods that combine auditory and visual stimulation with EEG, to produce useful and objectively designed protocols for training the individual. Copyright: T. F. Collura, Ph.D., P.E., Author and AVS Journal, Michael Landgraf, Publisher (2006) CA. This essay outlines some general issues and introduces some specific considerations relevant to the scientific understanding of the mind and brain. It is intended to elevate critical issues with regard to the current state of this understanding, and to define some simple concepts that may help to move this understanding forward. This work is based on a synthesis of ideas derived from neuroscience and psychophysiology, combined with a novel approach to the understanding of the electroencephalogram (EEG). These ideas are presented in a very basic form, and should lead to specific approaches to the measurement and analysis of brain processes as revealed by the EEG. It should also lead to the development and improvement of methods for the diagnosis and treatment of mental conditions using EEG and neurofeedback, in conjunction with various forms of sensory stimulation. What is needed is a scientific development that accomplishes for the mind what chemistry has done for the physical world. That is, a science that includes simple, terse models for the underpinnings of thought, and that can be used to derive the experiences of thought, both behavioral and introspective. The field that we call Psychology barely approaches this goal. It has a moderate ability to connect with our understanding of the physical brain, but it lacks rigorous and complete models that are based on neurophysiological principles. While we have the beginnings of some of this science, we do not have anything near what has been achieved in the physical sciences. There is little agreement on anything approaching a cohesive model of the substrates of conscious thought. The clinical effectiveness of conventional methods in psychology and psychiatry border on chance, further indicating that this field is still in the stage of being alchemy rather than science. In particular, our ability to apply EEG recordings and methods to the study and development of the mind is in its infancy. Nonetheless, recent progress using neurofeedback to treat conditions such as ADD, depression, autism, and other disorders, indicates that there is significant promise in this area. We have demonstrated the fundamental possibility of affecting the structure and function of the brain using biofeedback techniques, and even simple methods may be as effective as medication in treating a wide range of conditions. This underscores the remarkable plasticity of the brain, and its ability to learn. We may anticipate further conceptual breakthroughs in the near future that could revolutionize both our understanding and our ability to address the issues of the mind and brain in a constructive manner. It is hoped that this will help to sweep away much of the imprecision, bias, and parochialism that currently dominate theoretical and clinical approaches to the mind. Whereas we are very good at describing the world around us, we are very poor at describing the world of our thoughts. Tibetan Buddhists are perhaps the masters of this. Nonetheless, we should look to create a vocabulary and set of paradigms that penetrates the layers beneath what we commonly think of as thought. To extend the analogy with the physical world, we have had our “biology of thought” defined. Freud, Jung, James, and others have been our Lamarke, Darwin, Linneaus, and Mendel. What we need now are the Pauling, the Watson and Crick, and the Krebs to take us the next level down. We know what the “organisms” of thought are. They are the ideas, thoughts, impressions, perceptions, opinions, moods and other major entities that are the realm of psychology. What we know of them we know from behavioral studies, and a first level of introspection. What they are comprised of, we do not know. That is what we are looking for. What are the “organs” and “molecules” of thought? How does the brain produce them? What is their “molecular biology”? From the work of Damasio, Calvin, Crick, Freeman, Edelman, and others, we have some rudimentary, basic concepts about brain dynamics relative to thought. We know that the brain contains neural subsystems that receive trains of stimulation, and that reverberate in a complex way, in accordance with the laws of nonlinear chaos, to achieve states and state transitions that lead to recognition, memory, and other primitive processes. What we would like to do is to find a connection with the EEG signal in a way that explains what we know about EEG dynamics in connection with moods, states of mind, and behavior. This connection should also have bearing on the observed effects of light and sound stimulation, which can cause a variety of affective states, depending on the frequency and structure of the stimulation. Our basic model is this: The response of a given cortical sub-circuit to an incoming burst of stimulation (whether from the outside world or from a lower brain center) produces what we will call (for now) a “process burst”. This burst is a short (250-300 millisecond) pattern of reverberation that is determined by the resonant properties of the sub-circuit. Although we only see a simple burst of EEG activity, we know that there is a complex pattern of information processing underlying the burst. It is the underlying processing that we wish to understand. It is as if we have a scale, a thermometer, a barometer, and we wish to begin to develop the science of chemistry. Instead, we have an EEG instrument, some lights, sounds, and the introspective and behavioral reports from our subject. Copyright: T. F. Collura, Ph.D., P.E., Author and AVS Journal, Michael Landgraf, Publisher (2006) CA. All rights reserved. by L. Jerry Cunningham, Ph.D. The Caldwell School District initiated a Neurofeedback program in the Fall of 1999. L. Jerry Cunningham, Clinical Psychologist, directs the program. My experience in the field of biofeedback began with peripheral procedures in research conducted by John and Patty House, M.D. and Ph.D. respectively. The research utilized temperature and muscular training in the treatment of Otologic disorders. The technology was very primitive in those days by comparison, but the results were significant and indicated the power and promise inherent with biofeedback procedures. The author’s more recent experience was obtained with the Othmers at EEG Spectrum. The experience included their comprehensive course in Neurofeedback, their alpha-theta course and a course in peripheral procedures using Thought Technology systems; my experience also including working in the EEG Spectrum Encino (California) Clinic with Sue and Siegfried Othmer. Additionally, the author assisted in the development of a small Neurofeedback program at the Holman Group which is a managed mental health company. During this time Michael Landgraf and myself worked conjointly with several clients and began exploring the possibility of integrating Neurofeedback with light /sound procedures, a binaural beat generator, affirmation tapes, as well as the Syncroenergizer. The above experience provided the background for initiating the Neurofeedback program in the Caldwell School District. In order to start the program the Caldwell School District purchased the Neurocybernetic System from EEG Spectrum as well as the peripheral software from Thought Technology and the TOVA (Test of Variable of Attention). Our initial goal was to treat Attention Deficit Disordered and Conduct Disordered children and to develop a program that eventually utilized various modalities such as the New Visions program had already done under the direction of John Anderson and Michael Joyce. The experience with the program throughout the year was both interesting and challenging. It became immediately apparent that the impact of the program on a district-wide basis would be very limited. The limitations were due to our very limited budget and time allotments. One Neurocybernetic system and three days of time allotment for both administration and treatment made the number of students reachable with classic Neurofeedback quite limited. Our first decision was to limit the program to one school out of the nine in the district. This decision in retrospect was a very wise one and further expansion of the program will be on a school-by-school basis rather than district wide. We also began addressing the question of how to increase the impact of our particular program given the limitation of our budget. Consequently, once again the possibility of interfacing light / sound procedures with Neurofeedback seemed a logical direction. The research by (This free copy of the AVS Journal is courtesy of: www.Mindmachines.com / Published by: Michael Landgraf Enterprises, LLC) Russell and Carter. The Michelette dissertation and clinical research by Ruth Olmstead suggested that light / sound procedures with certain children might be able to accomplish results similar to those obtained by Neurofeedback. Given our interest in exploring this possibility Michael Landgraf donated very generously to the Caldwell School District three Pro Tutor light / sound units, two dual binaural beat generators, a CD with dual binaural beat session tracks and the ADHD light / sound programs developed by Ruth Olmstead. With these additional devices we began exploring how to utilize them effectively in our program. As a result some students were given a combination of Neurofeedback and light / sound. We utilized open-eye l/s glasses so that the student could receive simultaneously auditory and visual feedback from the Neurofeedback system as well as entrainment from the l/s equipment. During simultaneous administration we would use l/s frequencies that were compatible with the chosen Neurofeedback frequencies being trained. For example, if we were training within the beta range with a theta inhibitor, we would utilize the 17Hz-Olmstead light / sound program. The value of the Olmstead ADHD programs is that she has kept the frequency constant throughout the entire program and only the tone pitch is altered. This permits one to train as well as entrain at compatible frequencies. Other children were given light / sound exclusively and others given Neurofeedback one day and light / sound the next. Since we had three light / sound devices we could provide interventions for three students at one time and by this method dramatically increased the number of students we were impacting. Another observation that was very critical during the year was the student’s interest and motivation to cooperate and participate in either intervention. Students would routinely become bored with Neurofeedback about ten to twelve sessions into the treatment regime. First they wanted to try all of the games that were available on the Neurocybernetic system and after that they wanted new or different or more challenging tasks. With persistence, persuasion and coaxing, one could often get their cooperation for additional times. Light / sound was also difficult to keep their interest past the first six or seven sessions. They were clearly fascinated with the light and pattern displays at first and then they began to get bored. However, when I discovered, with binaural beats, the student’s experience and cooperation changed dramatically. We would use music that they loved as the selections to be utilized during the light / sound sessions. Many of the students wanted the Disney classics: Lion King, Aladdin, etc.. Some students even loved more classically oriented music. The important issue, however, was the immersion effect that occurred when the music was simultaneously fed into the same headphones that delivered the binaural beats. After this adjustment there was very little resistance to the light / sound procedure. As a matter of fact, students would often come by and beg to have a light / sound session above and beyond their scheduled appointment. It is difficult to describe the shift that occurred with their interest and motivation with just this one adjustment. It was the music- that they loved -that was the changing factor. During the year several students made very dramatic changes both on the TOVA and a district however, were not as complete as we had hoped. Due to one of our staff being very severely ill and out of the district for six months, the district workload in the Psychology Department at the end of the year made it impossible to do all of the final assessments that we had intended. However, those that were completed were very encouraging. One case in particular is very interesting and noteworthy. Janice (not real name) was a junior high student with severe behavioral problems, high levels of resistance to the treatment program and yet a normal TOVA. We did SMR training for the first fifteen sessions and she remained resistant and oppositional throughout. However, at that point we changed to Alpha-Theta Neurofeedback and she began to quiet and respond. 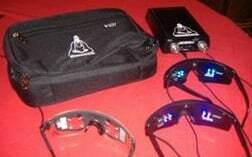 During the third Neurofeedback session light / sound closed-eye light glasses with the Schulman frequency was added. Within five to six minutes she manifested the classic Alpha- Theta crossover that Penniston suggests is a goal of Neurofeedback treatment. This combination was maintained for the remainder of the school year and each and every session she showed the classic Alpha-Theta crossover. In addition she made very significant clinical gains thereafter. She became very cooperative with therapy, she became pleasant and delightful and her mother stated that she is a changed girl. At the end of the year it was a delight to work with her whereas at the beginning it was painful just to attempt therapeutic intervention. This next year we will begin to add more therapeutic modalities with our treatment program. Specifically, the author has been impressed with the information regarding the procedure known as Brain Gym. This is a simple procedure to initiate in conjunction with both Neurofeedback and light / sound and also something that teachers can be trained to do with the student in the classroom. Two of the psychology staff members will also complete training in Rapid Eye Therapy and Thought Field Technology. We will explore introducing these two modalities with some of the students in the Fall. Some of the algorhythms of Thought Field Technology can be taught to the students and they may be able to use these to produce “self-calming” and to increase focus and attention. Clearly, many new and exciting therapeutic interventions are emerging in the mental health field. Some of these interventions appear to have increased effectiveness and treatment time that is shorter than the classical talk-oriented therapies. Our program will continue in the Fall and is one of a very few in the United States that is using both Neurofeedback and light / sound interventions. Copyright AVS Journal / Michael Landgraf, Publisher and L. Jerry Cunningham, Ph.D., Author. All rights reserved.